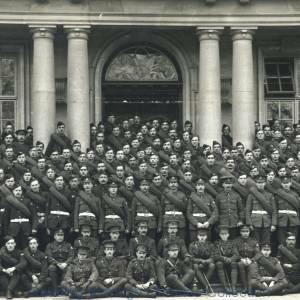 "B" Company, 7th Battalion, Royal Berkshire Regiment, Shire Hall, The Forbury, Reading, 1915. "B" Company of the Seventh Battalion (7th Battalion), the Royal Berkshire Regiment, photographed outside the Shire Hall in The Forbury, Reading, in April, 1915. 1910-1919. Black and white photograph; 10 x 30 cm.